Back in the day when reviews first came about most businesses treated them as a nuisance, but not Red Carnation Hotels. So what did they do differently and what has been the outcome of their strategy? The first thing: they faced facts. Having acknowledged that there was no way they could take on the giants of the hospitality industry budget for budget in conventional marketing they saw an opportunity with reviews that few others grasped. And then they determined, right from the word 'go', that they would shine. They realised that any good business, given the will, could thrive with reviews without massive expenditure, indeed without any direct expenditure at all. They had stumbled upon a marketing tool that did not put them at a disadvantage to the big groups and turned it into a positive advantage in their battle for the hotel dollar. 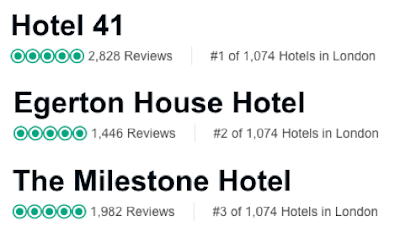 They set out to be the best reviewed hotel group on the web. Not just 'good' - not just great - the best. They made reviews their ally - not something to dread. Most hotels are luck (or unlucky!) if one in a thousand of their guests write a review. Red Carnation realised that in the remaining nine hundred and ninety-nine there was a vast resource waiting to be tapped. And so they set about tapping it. They motivated all their staff to focus on getting reviews to TripAdvisor* - from the front desk to housekeeping. They made sure staff made every effort to manage issues that might lead to a negative review before the guest departed the hotel. They maximised the potential for getting great reviews to TripAdvisor by refining every aspect of the process that would lead to getting that crucial review. 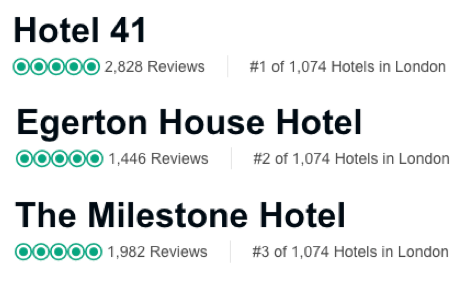 The top three hotels in London? The Ritz, Claridges and the Connaught? Not according to TripAdvisor! There may be better hotels for some people - hotels are a matter of taste after all - but no-one can gain-say that Red Carnation properties look amazing online. Given that you do a good job for your customers - and that must be a given - the next step is to 'do a Red Carnation' with reviews. Make review management part of your core marketing strategy and embed it into every part of your business. "I'm too busy to focus on reviews"
"We don't have the resources to focus on reviews"
"Reviews don't impact on our bottom line"